Since writing about a Jamaican Jerk shack a couple of years ago (read blog), I have been on a hunt for a similar eatery serving this Caribbean cuisine that many establishments disappointingly offer as pale versions for my taste buds. So, when a reader following my blog made mentioned of a nearby location, my ears perked up as I listened attentively. Unfortunately, due to distractions and slow-firing synapses, I did not follow-up with my intention and I forgot the name of the place. A couple of weeks ago, such place was highlighted in one of my restaurant online review weekly mailings. That night itself, I paid the first of a series of visits to write this review. Unforgettable Flavors (yeah, I know, how could I forget it) is located in College Park, MD, at the basement of a multi-story apartment building in a cluster of them, a most unlikely place to run an eating business. After reading many glowing reviews online and tips on how to reach the place, I did not have problems finding it and walking through its doors, unlike some online reviewers and a Washington Post reviewer, who wrote two paragraphs on his woe (seriously?). 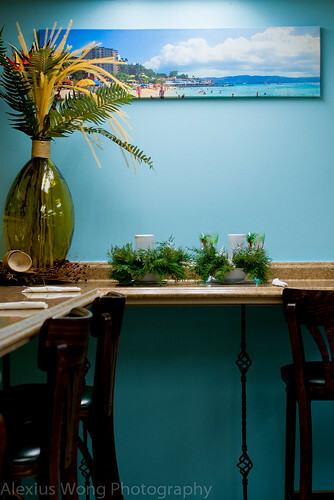 Walking into the brightly lit space with only 8 formica laminate tables, a take-out sofa, and some wall countertops, one notices that half of the shop space is taken up by the order counter and the kitchen. Despite the lackluster appearance of things in the space, although brightened up by the vivid wall paint and equally colorful paintings, there is a buzz that forecasts that something exciting is happening here. While sipping on the complementary amuse-bouche of a demi-tasse of soup (different concoctions on each visit: oxtail stew, red snapper bisque, chicken and 16 beans – all well-seasoned and packed with flavor) that injected more anticipation within, I quickly surveyed the menu with the traditionally inspired dishes that would make up this review. Most Jamaican eateries have their homemade drinks and juices displayed in the mixer sitting on the order counter, and this place is no exception – but I had to try them. 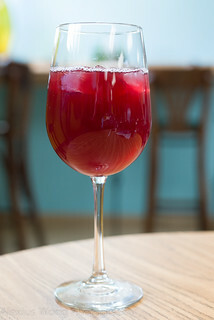 The first glass was Sorrel, a hibiscus flower drink. The wine glass contained the reddish drink that had its characteristic slightly tart quality, a light tannin puckeriness, slight ginger bite (a new twist), and a judicious amount of sugar that was just right for my taste buds, all elements bringing a smile to my lips, and a sense of antioxidant relief to the body. 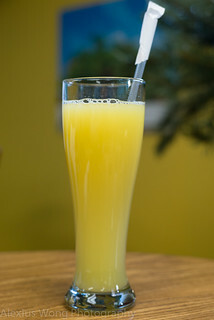 Another day’s drink was made with pineapple juice and ginger. 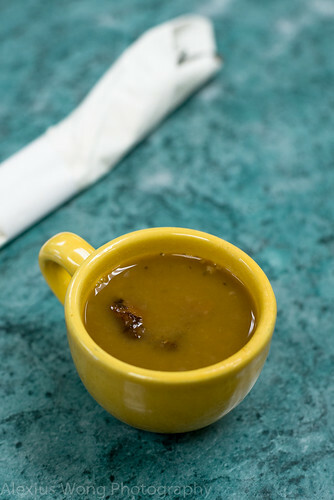 This mixture was irresistible with the fresh and naturally sweet fruit juice, punctuated by a stronger ginger note that provided some heat to the back of the throat and woke all the senses up. The chef said it was made with fresh pineapple juice, which I appreciated every drop of its oh-so-goodness. Again, the sugar level was just right, allowing this sugar-sensitive imbiber to return to his tall glass without any reservation. 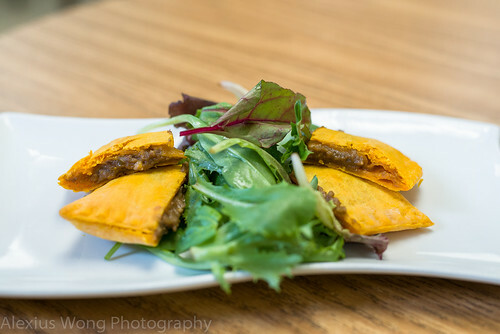 One of the litmus tests of a Caribbean eatery is usually with the Patties. The first version I tried was made with beef. The cut-up pastries arrived on a bed of mixed leaf salad (nice chefy touch) looking similar yet different from the versions I’ve had. The pastry was the orange-hued flaky dough, a tradition trait, but there was no pocket of air like others I’ve seen. The filling was savory without the usual over-seasoning (others), and there was a mild chili burn that crept up after a few bites. What I enjoyed about these bites was the home-made quality and the balanced seasoning that did not make them too “beefy”. A spinach version was ordered on another occasion. The pale flaky crust (traditional look) held a smooth filling exuding a mild vegetable flavor with bare bitterness, an intriguing Indian-inspired spice note, and a level of savoriness that brought a level of satisfaction and fascination with each bite – I just could not get enough of it. The side sweet sauce was unnecessary when we already have a wonderfully made vegetable pastry like this version here. The patties here standout in a subtle way with their well-balanced flavors and seasoning, as well as their in-house made appearance, which make them worthy meal-openers. Another appetizer savored was Jerk Wingettes. Usually, I would turn my nose up on an order of wings as I find most renditions to be characterless and rather pedestrian. 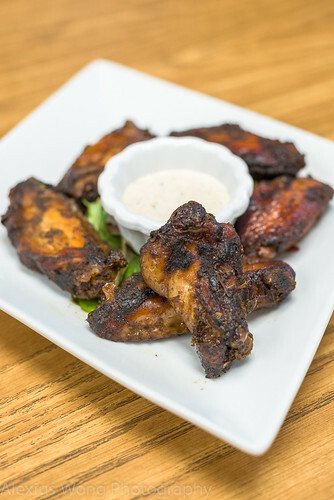 But I was curious to see how these wings would be treated with the classic Jamaican seasoning. One bite into the first morsel hooked me immediately. The flesh was well-cooked, firm yet moist, with a slide-off-the-bone quality. But what reeled me in was the jerk seasoning that was generous on each piece, dried out from the cooking and smoking, and permeating all the way to the bone judging by the light pinkish hue (not signs of raw meat) found in each bite. Before I knew it, my partner and I wiped the plate clean with no shame. The side of ranch dressing was home-made, tasting more flavorful than the store-bought version – but, it was more a distraction from the real star of this small plate. A portion of the menu is dedicated to breakfast, and there was a single dish that grabbed my attention. For the longest, I had heard of Ackee and Saltfish, and I was thrilled to find it here. So, after a busy morning helping out at a food pantry, I arrived past breakfast time to order this, and Chef Neville was happy to oblige me with this late order. The dish arrived with a melange of colorful ingredients looking like scrambled eggs accompanied by some fried bread. My first bite spoke ,”Now, this is what they have been talking about.” The yellow bits of the Ackee fruit had the soft texture of French-style omelette while they exuded a light tartness that made them more intriguing, this coupled by the acid in the tomato pieces The shredded salted fish still retained its salinity along as its slightly rough firmness. But it was the pieces of fried bread that tied all flavors together with its perfectly fried lightness, and a slightly savory dough that acted as the perfect canvas for all the disparate elements in this composition. I was thoroughly enjoying this dish not just for its satisfying flavors, but also for the cultural and gastronomic journey that whisked me away to warm waters. This is truly The Breakfast of Champions (what say you, Mr. Bolt? ), at least for that part of the world, and for this diner that afternoon. 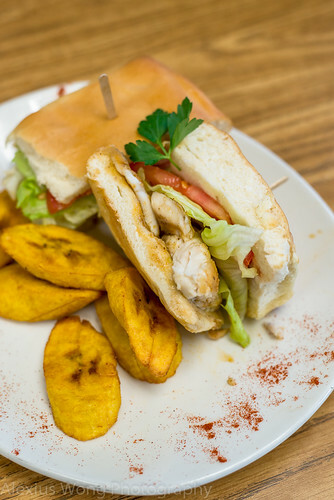 For another trip during lunch, I chose the Spiced Tilapia Sandwich that is listed on the menu as one of their popular dishes. The plate arrived with fish fillets sandwiched by Coco bread and the usual tomato and lettuce garnishes. Since I’m not a big french fries type of guy, I opted for something more interesting and appropriate for the cuisine – fried plantains. The pieces of seafood were well-cooked since they were quite moist and tasted fairly fresh, while the Coco bread was pillowy soft and added a slight sweet note to the mix. However, my taste buds were distracted by a number of things. The filets were underseasoned and I was barely detecting any spice heat that would make them exciting. 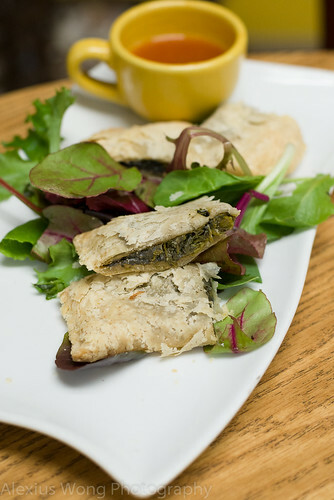 Furthermore, the soft texture of the fish paired with the soft bread became a gray-on-gray textural issue for me as I was yearning for some contrasts in the flavor and texture departments – maybe a slightly crispy outer coating would have done the trick for me. The inherent muddiness of tilapia, found in the dark red central nerve, was overwhelming for me on this occasion – I usually remove this portion when cooking this fish. But all these issues are easy quick fixes that I know this creative kitchen can get it right. The perfectly fried plantains (in clean fresh oil, yes!) were not too sweet nor too bland, reminding me that this is not dessert nor plain starch. 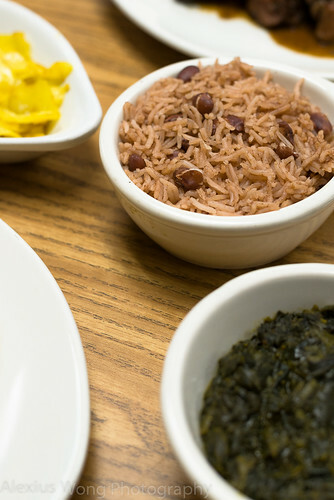 No Jamaican establishment would have the following meat dishes amiss from its menu, and I managed to savor a number of these offerings here. On my first trip, I ordered a combination of Jerk Chicken and Brown Stew. The Jerk was properly cooked with no excess moisture (usually from baking), with the firm flesh falling off the bone, and with the skin completely rendered of fat. The seasoning was “proper” with the right mixture of aromatic spices and the scotch bonnet heat that was both present and lingering in each piece. There was a certain smokiness that added to the flavors which I read that the kitchen has found an ingenious way of imparting it without illegally sending smoke billowing out of the apartment building, unlike the aforementioned place in the opening paragraph. One forkful of the Brown Stew said Grandmother’s Chicken Stew; well, my grandmother’s. The chicken was fork-tender while holding its meaty integrity. But it was the level of savory umami-ness that permeated throughout each bite that prevented me from putting my fork down. It even pressed me to ask the chef if any soy sauce was present, to which he replied that it had burnt sugar to give the depth of flavor in the sauce. An order of Braised Oxtails was equally satisfying. 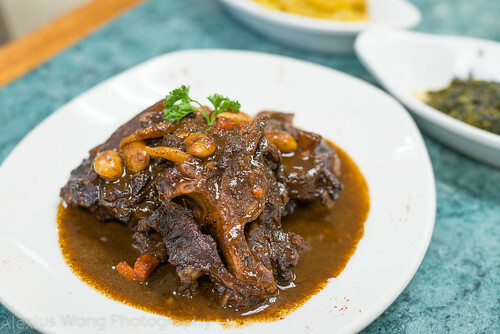 The meat to bone proportion was generous in favor of meat, and each meaty morsel was braised long enough to be fork-tender without falling apart. But again, it was the sauce that made the dish with its meaty savoriness as well as a great depth of flavor that would make it finger-licking-good. The topping of butter beans nearly stole the show with its proper cooking and amazingly smooth quality that was making overtures to cheekily compete with its beef partner. The sides that came with these orders (2 per order) were equally savory and impressive. The Braised Curry Spinach won me over immediately with its smoothness like creamed spinach (maybe a bit of dairy here) and the garam massala spicing that took these greens to another interesting level. The Rice and Beans were proper but with the use of Basmati rice that give it a twist; the undersalted perfectly cooked fluffy grains were the perfect foil to the rich brown stew sauce. The Curried Cabbage was irresistible with the non-mushy leaves cooked with a light hint of curry and enriched by some butter that complemented the cabbage’s sweet notes. As one notices, the kitchen does pay attention to small details, and such gesture makes the whole meal worth being resavored in the mind, even days after. Back to the first visit and to the sea. My dining companion was in a mood for something rather light, and he caught eye of a salmon special listed on the specials menu board outside. What arrived was visually appealing and it brought a smile to my friend’s mouth. 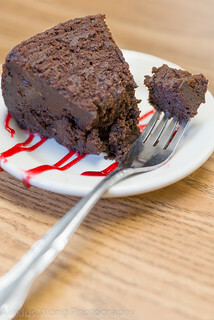 But what got him effusive with complements was the first bite of this dish – I had to have a taste of what he was raving about. The salmon was perfectly cooked, slightly firm but moist, further moistened by a beurre blanc sauce that was rich and slightly tangy. The topping of julienned squash, zucchini, and carrots added the healthy element to the dish, alongside a triangle of crispy puffed flatbread. You know a dish is that good when the complements do not stop at the last mouthful, as was in the case of my friend. 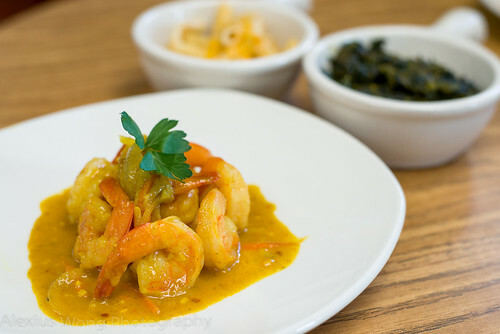 A lunch order on another visit was Coconut Curry Shrimp. When the plate arrived, I knew that the dish’s neat beautiful appearance was going to reveal something good. The pieces of deveined shrimp were perfectly and skilfully cooked without a trace of rubberiness, which I found very impressive. Equally impressive was the sauce that was not overwhelming with its slight coconut creaminess, the judicious scent of curry powder, and the right chili heat from dried chili flakes. A tinge of sweetness was the agent that rounded these flavors in this impressive dish whose sauce was nearly licked off the plate – again, we see the chef’s sense of restraint and balance in his cooking. The side of Mac and Cheese made me appreciate this dish after taking a haitus from it. The perfectly cooked penne (in between al dente and overcooked) was topped by a light and flavorful bechamel sauce and gratineed with a mixture of cheeses that exuded some tartness and bitter notes in the rich creamy mix. Sometimes less is more, as in the case of the toppings in this home dish. I could not get away from the sea with the offerings here, which is of no surprise to any Jamaican. I had in mind to try the Kingfish, which I requested it cooked “escovitched”. 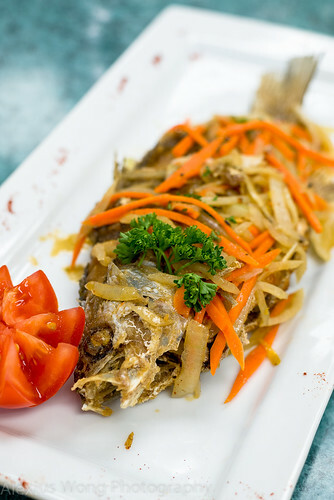 However, Chef Neville came out from the kitchen to tell me that Red Snapper was a better choice, and that he would prepare it especially for me – how could one say no to that. What came out from the kitchen was truly worthy and a spectacle for the senses. After taking the necessary photos, I contemplated how much could I eat from the dish since I had finished off the jerk wingettes. What was left at the end were just fins, head, and bones. The fish was fresh tasting with its unique slightly dark seafood flavor, perfectly cooked to retain the moisture yet crispy on the edges. 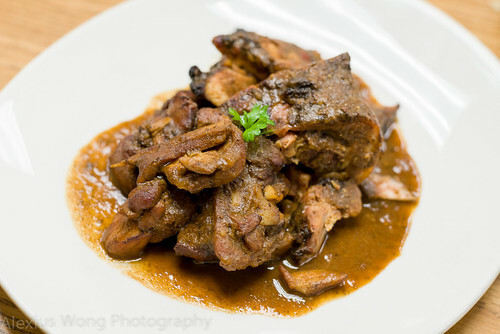 The escovitch sauce possessed restrained amounts of vinegar, sugar, and chili heat along with the noticeable acrid notes from the scotch bonnet pepper, allowing for the seafood flavors to standout from a sauce that could possibly overpower the delicate flesh. Wow. Such skilful tight-wire act needed no comprehension by my taste buds which instinctively ravished what it knew as damn good. What is a non-smoker’s version of a post-meal smoke especially after ingesting this incredibly well-executed dish? Well, the answer to the above question (although meant to be rhetorical) is some great desserts. Rum Cake was immediately the bulls-eye once I saw it in the display counter. One bite into it was not what I expected at all. Familiar memories of steamed Christmas pudding came to mind (from my adolescent years in England), and I could detect bits of soft prunes and raisin in this amazingly moist and spongy cake; the kitchen staff later confirmed my suspicion of its make-up. The rum scent was fairly adequate along with the dark molasses-like notes, but I was in the holiday mood for more alcoholic indulgence with these bites. This was definitely not the usual rum cake but one that captivated me with this Christmas pudding version which is rarely served around here. 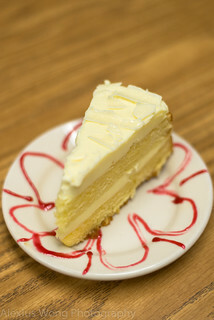 An order on another visit was highly recommended by online reviewers – Lemon Meringue Cake. Again, this sweet cake commanded all my attention. The moist cake was perfectly cooked with the right amount of ingredients and a noticeable lemon oil scent, coupled by the equally scented tart pastry cream interspacing the layers, and topped with some shavings of white chocolate. Mind you, I had already finished off some jerk wingettes and a whole red snapper. But this citrusy sweet finale prevented me from falling into gastronomic lethargy, and I had no problem finishing off every crumb off the plate. No thanks to the online reviewers for contributing to my struggles with a mini-diet. Respect, Skill, Understanding, Honoring Tradition, and downright Good Eats – these are the elements that I encountered at every visit at this unassuming restaurant that just kept my interests searching for more. Despite a minor hiccup with the fish sandwich, the rest that I savored from its menu kept calling up these thoughts about what the kitchen and Chef Neville were capable of. Starting from the drinks, leading to the Patties and Jerk Wingettes, to the Jerk Chicken, Brown Stew, Braised Oxtail, along with the myriad of side dishes, to the seafood dishes, and finally the desserts, especially the spiked Christmas pudding. 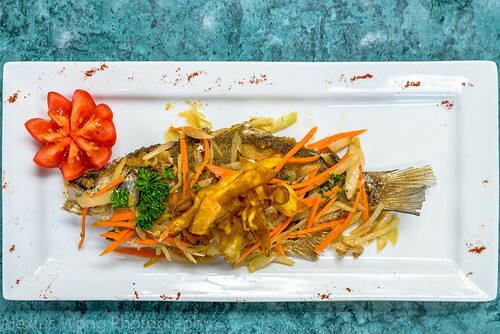 Obviously, not only does this establishment know what they are doing, but the kitchen possesses the understanding and skill level to impress anyone who walks through its doors with its Jamaican offerings (Chef Neville has done a few stints at big hotels including The Willard). As I end the year with this posting (Highlight 2014 blog coming soon) on a very high note, I’m glad to have stumbled across this eatery that makes me look forward to another place like this while I chase after the next gastronomic peak. 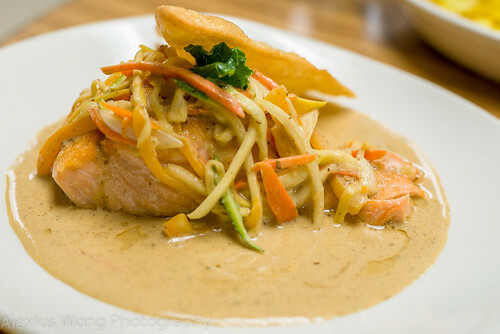 With such impressive cooking, who could forget the delectable dishes at Unforgettable Flavors. Directions: From the Beltway, take Route 1 South. Turn right at next light, Cherry Hill Rd. Pass shopping area, and look for Seven Springs Apartment on left – take the second entrance. The restaurant is located at the basement of last multi-story building on right, across from pool. We went there for breakfast, but ended up being too late. 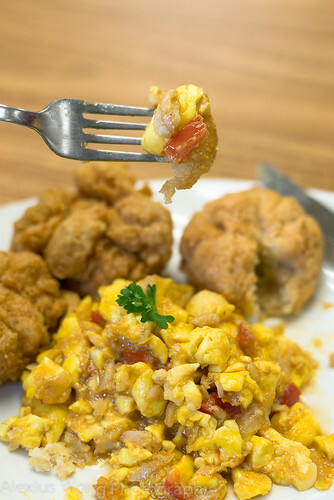 I cannot wait to go back to try the Ackee and Saltfish. I like that dish which I hope you will get to try soon. The food here is delicious, the shrimp Rasta Pasta is my favorite. And you cannot beat the prices.